In a historic verdict, the High Court on Wednesday declared the Turag River as a legal/juristic person or a living being to save the river from illegal encroachment. In its partial judgment, the HC bench of Justice Moyeenul Islam Chowdhury and Justice M Ashraful Kamal said Bangladesh, i.e. the humankind will fall in danger if rivers cannot be protected from encroachment and navigability problem. The court will deliver the rest of the judgment on Thursday with important directives to save the rivers. The court verdict came a day after experts and green activists demanded that the rivers be recognised as living being for saving those. The demand was made on Tuesday at the inaugural session of a two-day international conference titled 'River: A living Being' being at Kuakata of Patuakhali. 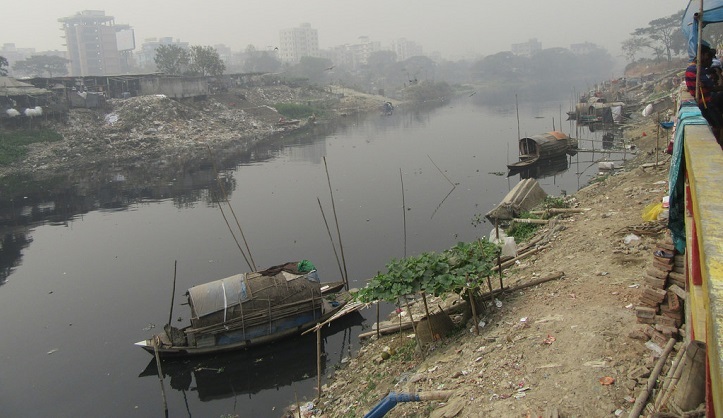 A World Bank study said four major rivers near Dhaka - Buriganga, Shitalakhya, Turag and Balu - receive 1.5 million cubic metres of wastewater every day from 7,000 industrial units in surrounding areas and another 0.5 million cubic metres from other sources. The Environment and Forest Ministry enacted a law in 1995 making it mandatory for all industrial units to use effluent treatment plants (ETPs) to save river waters from pollution, but owners often flout the rule. South Asia is surrounded by hundreds of rivers which are most inter-border ones and common natural assent for the people from Bangladesh, India, Nepal and Myanmar and deeply connected to their lives. Following a writ petition filed by Human Rights and Peace for Bangladesh, the judicial probe committee had submitted a report with a list of names of illegal grabbers and structures on the banks of the Turag River. Later, the persons and the establishments were made a party in the case. The court passed the verdict after hearing from the both sides. In the judgment, the court said rivers are one of the media of humankind's survival. "Governments of different countries are trying to protect rivers through enacting laws. If there'd been no directive in the form of verdict, there might have been high rises over the Buriganga River or a housing estate of an illegal grabber over the Turag River." The High Court said it earlier issued various directives to protect the four rivers surrounding the capital. However, the defendants did not take any step to implement the directives. "Had they taken steps, there would have been no need to file a separate case for saving the Turag River." It also said illegal grabbers are now feasting on some 450 rivers, including the Ganga, Brahmaputra and Meghna that are flowing through Bangladesh. The court also posed a question whether it is better to allow file a thousand cases to save all these rivers or issue directives in the case in question to save those. Mentioning that the rivers are shrinking due to the construction of illegal structures, the court said the Turag River was declared as a legal/juristic person considering the matter.